Home » Caraco a´la francaise in 1786. Since his first appearance as a jacket, in the early 18th century, Caraco has experienced several changes. Originally it was a dress, the skirt, the lower part was removed and the middle-class women in the face of his comfort quickly became popular. 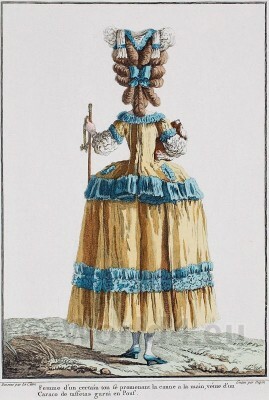 The first Caraco were worn very long. Later they ended up at the height of the pockets of the petticoat. It was close to the body, the sleeves usually ended before the elbow, and later they were three quarters long, and were filled with crossed gauntlets or cuffs. A plunging neckline, the neckline varied from oval to more conical, and was at the beginning of some moral criticism. When the nobility from the mid-18th century, this garment took the whipped cuffs were decorated with precious lace. On the picture you can see a precious Caraco from taffeta and gauze bouillonnée. The jacket was sewn on the back with pleats that open on the dress, the sleeves are padded and end up in lace flounces. The round collar is made of fine lace. Small bags are placed on both sides. The jacket is decorated with braided straps that continue colored curly hair in the fashion and dress. The lady wears a dog in her arms, a stick of ebony with an ivory tip in the other.